If you are about to move out of your apartment, you definitely want to do everything you can to reclaim your deposit. 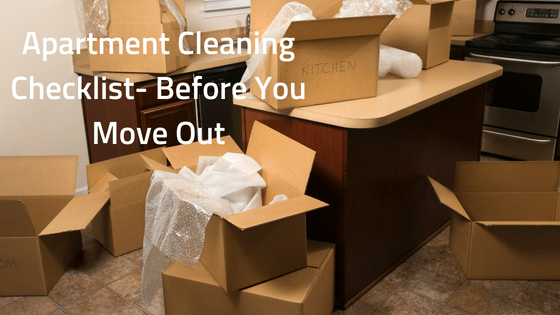 Of course, the lease agreement you signed likely states that it is your responsibility to get your apartment completely cleaned out so that it can be rented again quickly. Even missing a few little steps in this process can cost you big money, and slow down the property manager’s ability to get new renters in. This handy checklist will help you get all your bases covered. Kitchens and bathrooms are typically the hardest rooms to clean. They require the most detailed work, especially when it comes to cleaning out appliances like ovens and refrigerators, and they require some extra chemicals to clean them correctly. If at all possible, it is best to clean these rooms first and well in advance of your move. Keep minimal fresh food around in the final days, and your life will be much less stressful. Don’t forget to sweep behind appliances, and dust on top. The easiest way to clean your kitchen and bathrooms is to start at the sink and work outward. This way you always have access to fresh water as you’re cleaning the rest of the room. Whatever you do, don’t skip cleaning the tub. For some reason, one of the biggest challenges that people face is taking out all of their trash on time. Taking trash out a little at a time is a good way to ensure that there is nothing left behind at the end of your move. It also gives you more space to work with as you are moving furniture around. Dusting is an important part of cleaning out the apartment. Remember that dust builds up on ceiling fans, above your stove vent, and in window sills and blinds. Make sure you do your dusting before you clean your floors to avoid repetitive work. In addition, dusting with a wet rag, or wipes is much faster than feather dusting. The very last thing you should is clean the floors. Don’t just run a mop across the tile. Make sure you scrub the grout and get any stains out of the carpet before you vacuum. Most apartments charge you for steam cleaning the carpet after you leave, but you should check your lease to see exactly what your responsibilities are. The earlier you start on your apartment cleaning checklist, the easier the process will be. Getting trash and appliances out of the way first will make the rest of your moving a lot easier to manage. Cutting corners doesn’t pay off when you are trying to get your deposit back. For more helpful guides from Sugarloaf, visit us online today.